There is nothing "unusual or in the least bit wrong" about a US president wanting to speak with the leader of Russia, journalist Michael Isikoff said about President Trump's upcoming summit with Vladimir Putin in Helsinki. But, "it is unprecedented to have a situation where the US president is meeting in a summit with the Russian president while under investigation for his ties to the Russian president," said Isikoff, who serves as chief investigative correspondent at Yahoo News. "I think that has understandably raised a lot of questions and a lot of skepticism, and especially when we learned that the president wants to talk to Putin alone, without any other US officials present, it's inevitably going to raise concerns," said Isikoff, who co-wrote the best-seller "Russian Roulette" with David Corn, Mother Jones' DC bureau chief. This sense of the unknown, though, isn't unique to Trump's meeting with Putin -- it's on display in nearly every part of the Trump-Russia storyline. 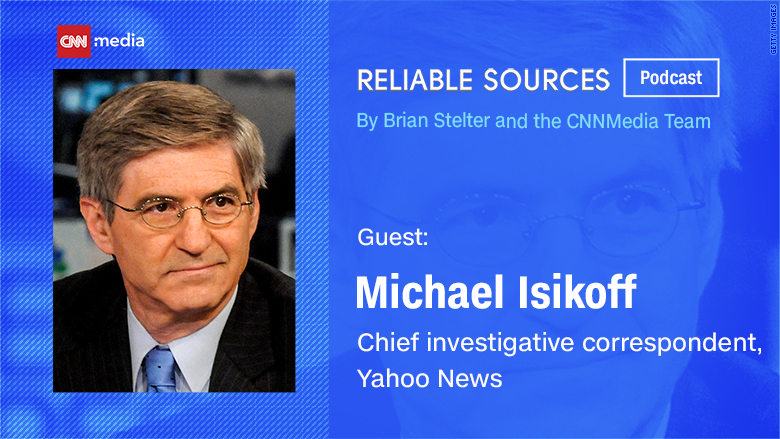 As the guest on this week's Reliable Sources podcast, Isikoff sat down with CNN's Brian Stelter to unpack what we still don't know about Russia, the Robert Mueller probe, and any potential interference in the midterms. Isikoff acknowledged that matters pertaining to Trump and Russia are confusing, due to their many components. "It's hard, frankly, for the viewers, for listeners, for the public, and for reporters, to keep the whole story straight," he told Stelter. What we do know, he said, is that there was a Russian attack on the 2016 election, through the use of information warfare, probes on state election databases, and social media troll farms. "And it was an attack," he told Stelter. "The word 'meddling' sometimes gets used. I don't think it quite does justice to the enormity of what was going on." Simultaneously, Isikoff pointed out, there "was this very concerted effort through multiple characters to cultivate people in the Trump world." This extended to Trump, his family, and campaign staffers. There were even attempts to set up a summit between Trump and Putin during the campaign. Trump and Putin have met before at other events, but there's a "fascinating backstory" between the two that goes back to 2013, Isikoff said. At the time, the Miss Universe pageant was being held in Moscow. Trump said that he hoped to meet Putin and wondered on Twitter if Putin would "become my new best friend." "The aspect of this story that has caused the most head-scratching among national security officials, counterintelligence people, everybody who's looked at it closely, is how do you explain Trump's repeated warm feelings about Vladimir Putin?" Isikoff said. There could be a risk, though, in journalists bringing up these unknowns. "Don't we have to be careful as we ask the questions not to come across as if we think we know the answers?" Stelter asked Isikoff. "There's no question there's been way too much speculation going on in this story," Isikoff responded. "We can't take it beyond what the facts are." Trump has contradicted himself when it comes to Putin. In 2013, Isikoff said, Trump said he had a relationship with Putin; in 2016, he said they had never met. And, as it turns out, Putin couldn't make the Miss Universe pageant. He did, however, send Trump a note, along with a black lacquered box delivered to Trump Tower. Trump has never explained what the note said, or what was in the box, Isikoff said. "There's a lot here we don't know," he said. "We can speculate. We should be careful not to over speculate and take the evidence beyond what it is. But as you point out aptly, this is a mystery."